Offering a complete selection of organic, all natural and eco-friendly products for your home and life that won't have you compromising your sense of style.At Eden Home our mission is to offer the purity of organic without losing the beauty, whether you're looking for organic bedding, clothes for baby, natural bath towels or organic cookware and more. 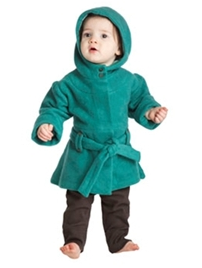 We love organic clothing, so I was thrilled to find Eden Home! Not only does Eden Home have a wonderful selection of children's apparel, they also have great home item's and gifts as well. After browsing through Eden Home's Children section I came across the Kate Quinn Organics Belted A Line girl's jacket ( pictured above). 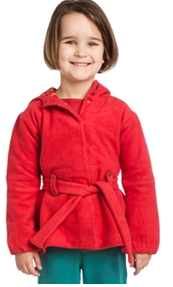 The princess received the jacket in the red color option (pictured above top) and absolutely loves it! It's not bulky, so she'll be able to move around freely and play ( the jacket will also be great for dressier occasions as well). She (and I ) absolutely loves how soft the lining is. She loved this coat so much...she insisted on keeping it on after we were done trying it on ( it arrived on a day that was well over 80 degrees!). We are more than happy with the Kate Quinn Organics Belted A Line Jacket! Great quality, and wonderful, fast and friendly service from Eden Home! OmG, It looks so soft and cuddly! I bet your little girl did love it.